This Instructable explains how to make a Simon Says game using an Altera DE2-115 Cyclone IV FPGA board. This project was done for ECE2220 (Digital Logic) at the University of Manitoba. The video above shows the working VGA output and how it changes depending on the input to the board. The project is written using Verilog HDL. Store and check capabilities that store the input from player 1 and player 2 and compare them to see if they match. The complete project file can be downloaded from this page. Remove the drum pads by pulling on them with both hands. Using needle nose pliers, remove the wire from the connectors being careful not to damage the circuitry. Connect wires to the female socket of each drum. Using a hand saw, saw a slit into the side of the case at each drum to ensure that the wires are not damaged during use. The verilog code for the integration and storing of user inputs can be found in the main module of the project. Because the drumkit outputs signals as an active low square pulse, the drums can be treated exactly as the push buttons on the board. - state: is the game or the user playing, or is the game in a static mode? - clk: the board's internal 50MHz clock. which is converted to a 25MHz clock in the code. The top module passes information to a display module that describes the location and bit pattern of each of the items on the display, along with their colour. The full VGA section can be downloaded from this page. Paul White, Ramin Soltanzadeh, Ahmad Byagowi and Jose Mijares Chan for their help with troubleshooting. This module verifies that the player 2 has entered the correct sequence of colours as displayed by player 1. These colours correspond to the rock band drum kit. 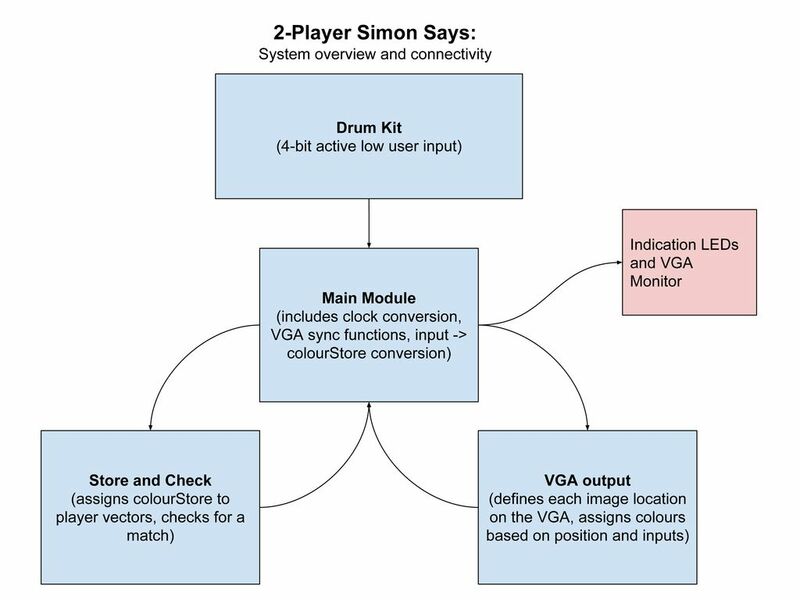 The store function fills each player's vector on the positive edge of the drum kit signal. On each positive edge, a register "colourStore" in the main module of the game is updated to the colours listed above. colourStore is passed to the store module where each player vector is filled. Each player inputs a sequence of colours. Once Player1 and Player2 are filled, they are passed back to the main module and checked for a match. Convert the VGA output to an image buffer array - similar to how screens are mapped by GPUs. Output text to the VGA display using a font ROM (this was started, and some code can be downloaded from this page). Use bitmap images for the buttons, instead of simple squares. Implement audio cues that correspond to the visual cues. Add multiple levels and more complex input sequences. This module was not included in the project, but could be implemented in place of Player 1. The Random Number Generation (RNG) is handled by a modified Linear Feedback Shift Register. The number generation is not truly random, being merely pseudo-random, but for the purposes of this project pseudo-random numbers work just as well. - The number can be inputted via a noise generator or switches to start and then afterwards the output of the module can be used as the new input. -A randomized 22 bit number. This module works by polynomial multiplication. By multiplying bits by the power of other bits many times, a very long sequence is created. The same “seeds” or starting number inputs will create the same sequence, but the sequence can be interrupted by changing Rounds and Levels or by losing at the game. An additional module takes this 22 bit input and uses it to create a vector containing nine 2 bit numbers. This vector is then outputted and passed to the rest of the project. The complete random number generation code can be downloaded from this page. Easics.be, 'Easics', 2015. [Online]. Available: http://rijndael.ece.vt.edu/schaum/slides/ddii/lec... [Accessed: 28- Nov- 2015].